Conjugate Heat and Mass Transfer in Heat Mass Exchanger Ducts bridges the gap between fundamentals and recent discoveries, making it a valuable tool for anyone looking to expand their knowledge of heat exchangers. 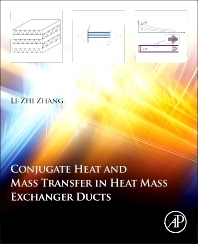 The first book on the market to cover conjugate heat and mass transfer in heat exchangers, author Li-Zhi Zhang goes beyond the basics to cover recent advancements in equipment for energy use and environmental control (such as heat and moisture recovery ventilators, hollow fiber membrane modules for humidification/dehumidification, membrane modules for air purification, desiccant wheels for air dehumidification and energy recovery, and honeycomb desiccant beds for heat and moisture control). Explaining the data behind and the applications of conjugated heat and mass transfer allows for the design, analysis, and optimization of heat and mass exchangers. Combining this recently discovered data into one source makes it an invaluable reference for professionals, academics, and other interested parties. Li-Zhi Zhang is a professor at the Key Lab of Heat Transfer and Energy Conversation at the South China University of Technology. He has worked with topics related to energy recovery and heat and mass transfer since 1992. Professor Zhang has also authored more than 100 papers and 4 books internationally.